I was reluctant to adopt trekking poles, relegating them to retirement age status and unnecessary weight. I also felt that toting them when unused would be cumbersome and stowing them a waste of valuable pack space. After several turned ankles during trail running and loaded training hikes, I finally started utilizing them but only for training, figuring that I still wouldn’t deem poles worthy during attempts on lofty climbing or hiking goals. Again, tweaked ankles, scary river crossings, and unstable scree slopes finally convinced me to try trekking poles during an alpine climbing trip, and I’ve never looked back. Delaying fatigue in the legs and providing security in a myriad of situations are reasons enough for me to put trekking poles on the gear list for any objective that involves even slightly challenging terrain. Poles that break apart into sections for storage inside the pack are preferable; poles lashed to the outside of the pack can fall out and get hung up on obstacles. Low weight is desirable but only if reliability and durability remain intact. Black Diamond Equipment’s Alpine FLZ Trekking Poles meet all these demands. The Alpine FLZ Trekking Poles ($150 MSRP) have three aluminum sections that fold to stow inside the pack easily. When terrain dictates, deployment is quick and simple via the ingenious Z Pole Technology. An internal Kevlar cord connects all the sections; extending the section below the grip tensions the cord, allowing Speed Cones to guide the sections together and a metal snap button locks it all in place. A FlickLock Pro system allows the total length of the pole to be adjusted. Watch this system in action here. Carbon poles can be lighter, but the aluminum construction of the Alpine FLZ Trekking Poles is more resistant to surface damage and worry-free. Carbon poles can be nicked on rocks, potentially creating a failure point. The cork grips are comfortable with both gloved and bare hands, and the EVA foam grip extension provides a cushioned grasp when choking up on sloped traverses. The tops of the grips are dual density polymer and shaped well for palming on descents. The wrist straps are made of breathable materials and anchored very securely to the grips. The carbide tipped poles (rubber tips available) accept both trekking and powder baskets, making them a multi-season, multisport crossover candidate. I tested the poles rigorously during a successful summit of Mount Baker in Washington via the North Ridge, done as a grade V carry over. This style of ascent gave me five days to use the poles in various conditions. They got abused throughout the steep wooded approach to the glacier, during glacier travel to the sheer sections of the route, and again on the descent down the other side. They also acted as tent guy line anchors and as a rope “bearing” during crevasse rescue training. The poles performed admirably, warding off banging into boulders and stabbing into harder neve. I heavily loaded the poles on the approach when the packs were fullest and again on the descent when my legs were extremely fatigued. The poles were constantly used to probe for crevasse edges while crossing glaciers. The aluminum construction provided confidence; I didn’t have to worry about sudden failures that are prone to damaged carbon (aluminum tends to bend first.) The Z Pole Technology worked as advertised; folding the poles up when the ice pitches started was quick and easy as was deploying them after summitting. The lack of threaded expansion cones assured against slipping under load or losing small pieces. There was a hint of movement at the lower joint of the section below the grip. This section is what slides to tension the pole together and houses the FlickLock length adjusting mechanism; the other section joints were rock solid. The movement was just noticeable and didn’t detract from performance. I chose to remove the wrist straps as I found them uncomfortable when the going was steep and time-consuming to manage. 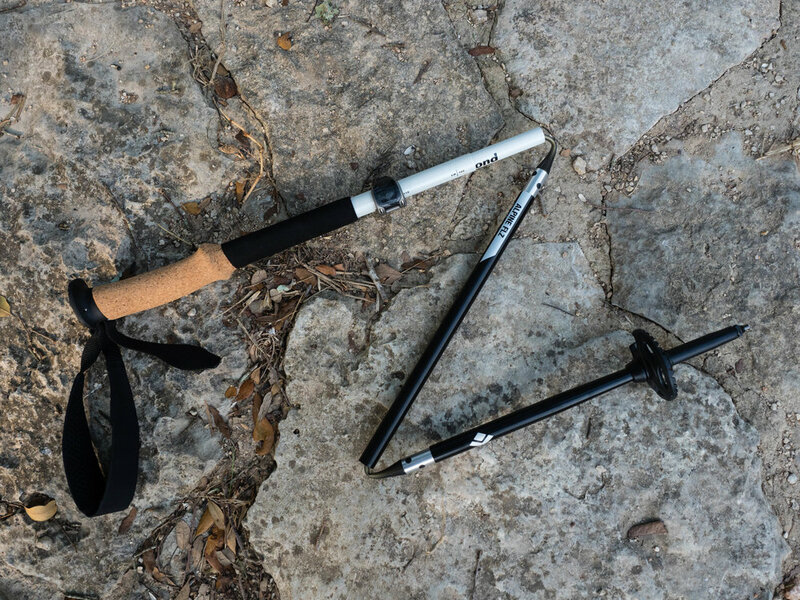 Saving the legs, providing security and potentially avoiding injury are all reasons to give trekking poles a try, and the Black Diamond Equipment Alpine FLZ Trekking Poles are worth a look. The Z Pole Technology works great, and the aluminum shafts promise longevity. They are adjustable in length, comfortable on the hands, and their weight is respectable considering all these features. Available in 95cm – 110cm (1 pound, 2 ounces per pair), 105cm – 125cm (1 pound, 3 ounces), and 120cm – 140cm (1 pound, 3 ounces) lengths.